American Cruise Lines was founded in 1991, specializing in small-ship coastal and river cruises throughout the United States. 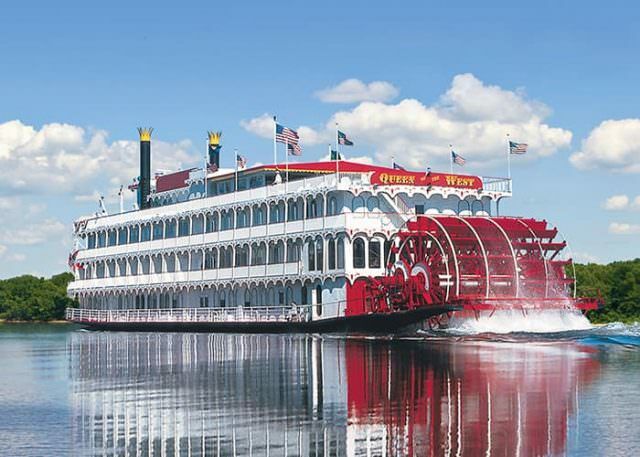 On the rivers, American Cruise Lines sails itineraries on the Mississippi, Columbia and Snake Rivers. On the Mississippi, American Cruise Lines offers nine itineraries that range in length from eight to 22 days. A total of three different itineraries are offered on the Columbia and Snake Rivers through the heart of Washington and Oregon State, running between five and eleven days in duration. American Cruise Line’s classic Queen of the West. Photo courtesy of American Cruise Lines. While American Cruise Line’s earliest vessels tended to recreate the Mark Twain-esque paddlewheeler lore of days gone by, the company embarked on an ambitious newbuild strategy for its river fleet in 2017, signing a letter of intent with Chesapeake Shipbuilding in Salisbury, Maryland for a fleet of five modern river cruise ships similar in design and style to the riverboats that ply Europe’s Danube and Rhine. These new ships will measure 345 feet (105 metres) in length and will carry up to 184 passengers. 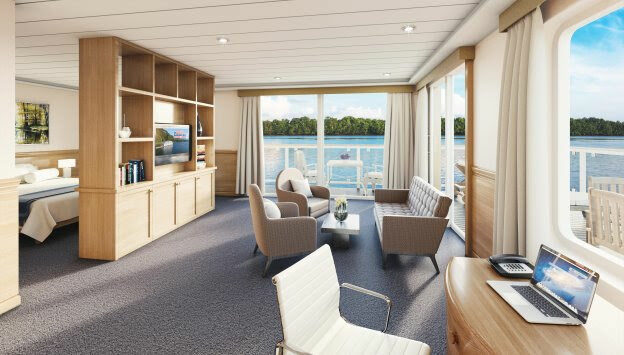 Derived from the basic design elements found on the company’s newest coastal ships, the four-deck-high ships will feature enlarged cabins with expanded bathroom facilities and private balconies. 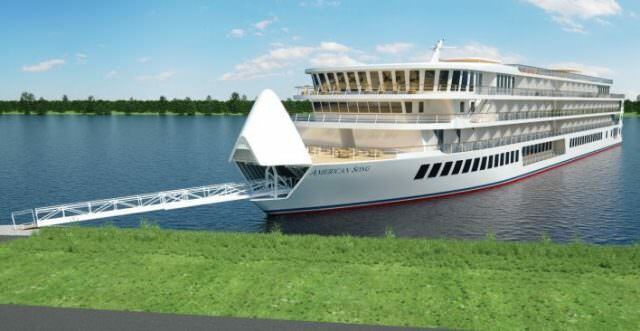 The first ship of this new class of American riverboat will take to the waters in the fall of 2018. Dubbed American Song, her inaugural voyage is set for October. 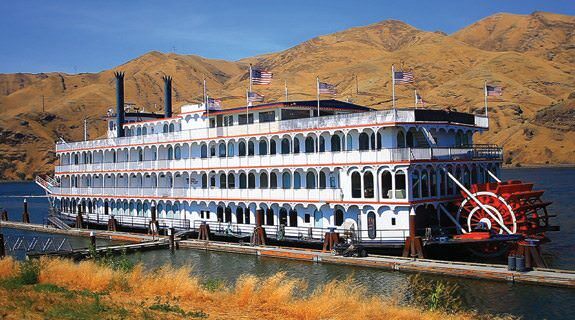 The American Cruise Line riverboat fleet currently consists of six ships, including the iconic Queen of the West, which first entered service in 1995 and has been lovingly cared for in the intervening decades. All ships feature complimentary Wi-Fi internet access; complimentary cocktail hours each evening; evening entertainment and music that reflects the destination; private balconies; elevator access; and large dining rooms and public areas. Four of these vessels are classically-styled paddlewheelers, while two vessels – American Song and American Harmony – represent a more modern, European design. In addition to cruises on the Mississippi, American Cruise Lines also operates voyages on the Columbia and Snake Rivers, shown here. Photo courtesy of American Cruise Lines. 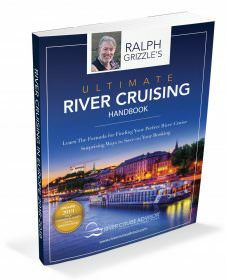 American Cruise Lines currently offers river cruise itineraries on the Mississippi River, and the Columbia and Snake Rivers that wind through the Columbia River Valley in Oregon and Washington State. Though it’s a hybrid ocean-river voyage, the line does offer a limited number of fall cruises along New York’s Hudson River, departing roundtrip from New York aboard one of American Cruise Line’s coastal vessels. American Cruise Lines: What Are Its Smallest, Largest and Most Common Staterooms Sizes? Room Service: Which River Cruise Companies Offer It? How Are Special Diet Requests Handled on a River Cruise? Laundry Services or Facilities: Which River Cruise Companies Include Them in the Fare? Fitness Centers, Pools & Bikes: Which River Cruise Companies Include Them? Free WiFi: Which River Cruise Companies Include It in the Fare? Private Butler Service: Which River Cruise Companies Include It in the Fare? Beverages: Which River Cruise Companies Include All of Them in the Fare? Airport Transfer Fees: Which River Cruise Companies Include Them in the Fare? 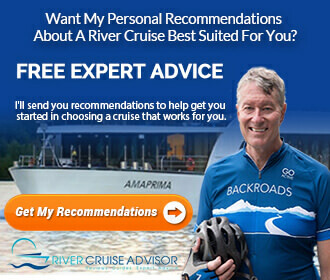 Shore Excursions: Which River Cruise Companies Include Them in the Fare? Solo Travel: Where Can You Find the Best Rates for River Cruises?